The hard work of a number of residents at Seasons Aged Care Kallangur in Queensland in knitting, sewing and producing pouches and liners for local rescued wildlife has been rewarded with a visit from the in-need animals. Local wildlife rescue group Wildlife Rescue Queensland (previously Bribie & District Wildlife Rescue Inc.) visited the Kallangur facility with a number of their rescued baby animals to pick up new donations and to thank residents for their support and efforts. Seasons Aged Care residents Mavis Ford, Ellen Fox, Nell Barr, Marlene Brittain and Valerie Nielsen presented the rescue group with their most recently completed pouches and liners, and enjoyed meeting some of the babies they had worked so hard to help. Community Manager for Seasons Aged Care, Janet Norman, says the residents enjoy helping out the group and “love” hearing that their work is making a difference. 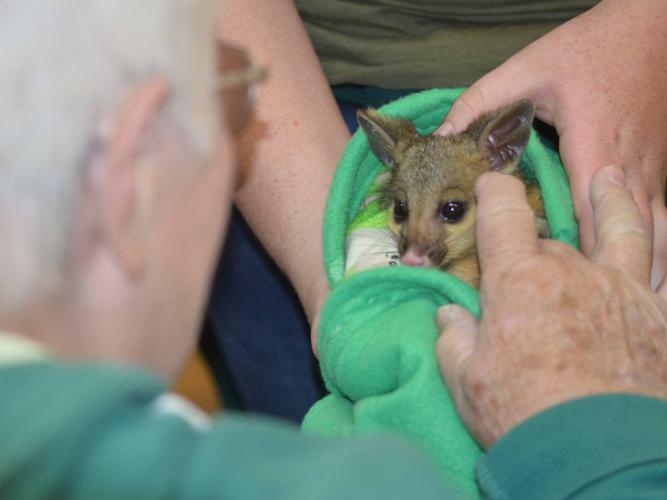 “Baby season has really hit hard this year and the group are experiencing an extremely busy time on the rescue front, with many native baby animals needing to be kept warm,” she says. Wildlife Rescue Queensland shared their experience with the Seasons Aged Care residents on Facebook - thanking the residents for their generosity and effort. “On arrival to Seasons Aged Care at Kallangur we were greeted by lovely residents who had taken the time to sew and crochet or knit these pouches,” the organisation says. “They were all so happy and smiling and interested in what we do. It filled our hearts with love and happiness. “Animals certainly have the ability to bring happiness to many people. Residents are now calling on donations of 100 percent pure wool, old flannelette sheets and polar fleece to make the next batch of pouches. Anyone in the local area can donate goods to the facility’s reception at 1321 Anzac Avenue, Kallangur.